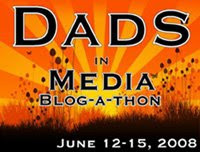 Over the next four days I encourage you to participate in the blog-a-thon celebrating the centennial of Father's Day, Fatherhood, and Media through your participation. I encourage anyone and everyone to write a post on anything relating to the topic of Dads in Media. This could be Father roles in Film, Music, Television, Literature, Art, Comics, or anything in between. Talk about one father in particular, talk about a career, a time period, or a concept. The field's wide open. Upon posting e-mail me or let me know in the comments so I can include it in the collection of post found her on StrangeCulture. Read the post that are in this collection. The role and purpose of this blog-a-thon is diverse. Part of it's reflection, part of it's honoring, part of its thinking. Parenthood and fatherhood is one of the earliest institutions of all time. What is our culture and media saying about it. As you read over the post, I encourage you to comment, interact, and dialogue about what others are saying. Let this post be the hub of the conversation, not the end. Tell others in your real life and in your virtual life about this blog-a-thon. The more participants the broader the conversation. So with this in mind and as post begin to role in over the next couple days...I present the first contributions. I look forward to seeing your thoughts, reflections, and creative juices at work. Scott Roche: Dad's In Media - DIM? Burbanked: Seven movie characters who might have benefited from things my dad likes to say. jasdye: This Dad in Media? Amy: Some of Favorite TV "Dads"
have been slowly making my way through the list. Still sad I couldn't participate, but I remembered too late and I was away all weekend long. Reading the pieces though is fascinating. Thanks a lot for the late add! Interesting article and great idea.